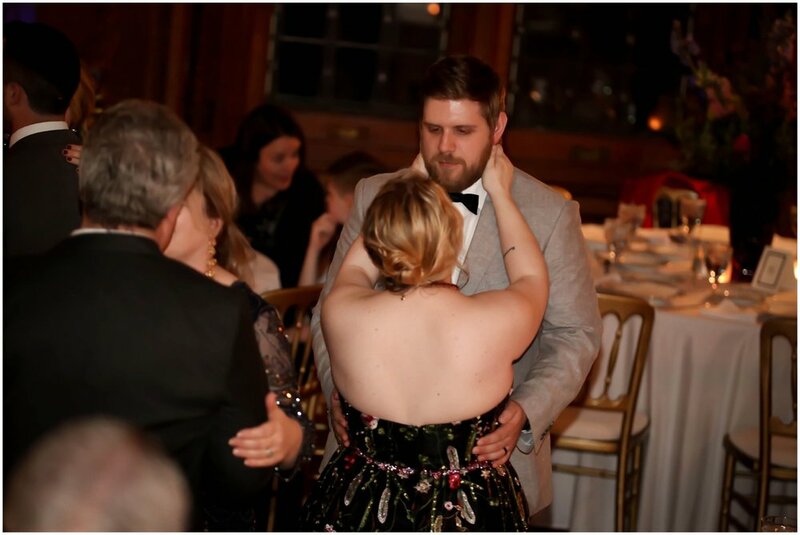 From Hannah: My sister Lillian and I both eloped and we were SO happy to be married, but our families deeply missed being able to celebrate with us. Our parents proposed throwing us an intimate banquet so that our closest friends and family could all be together to celebrate our unions! This seemed like a fantastic idea! 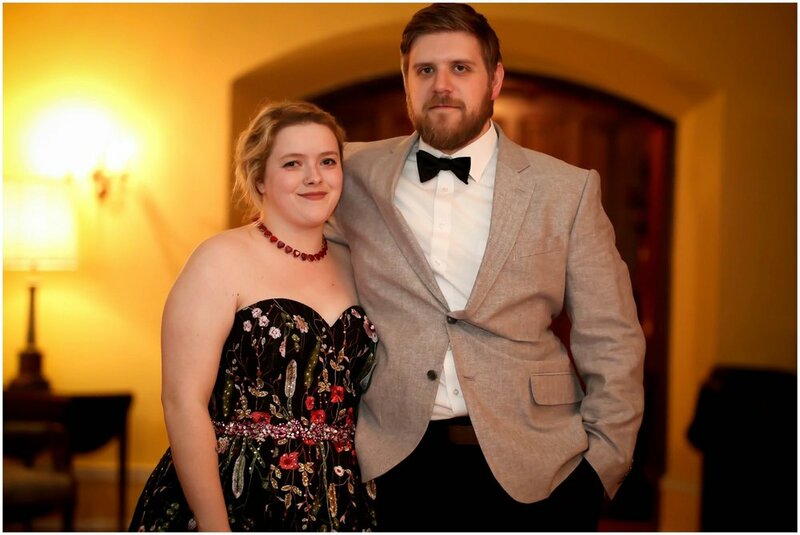 It was so nice having the nuptials out of the way and just getting to plan a big party! 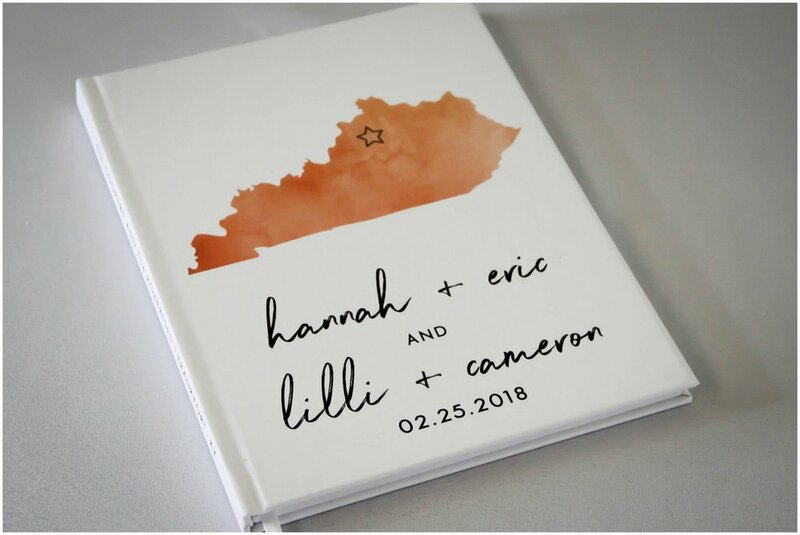 We agreed we wanted a venue that would be appropriate for a sophisticated reception and one that would showcase our lovely home state. When we toured Berry Hill Mansion in our state's Capitol, we knew we had found just that place! 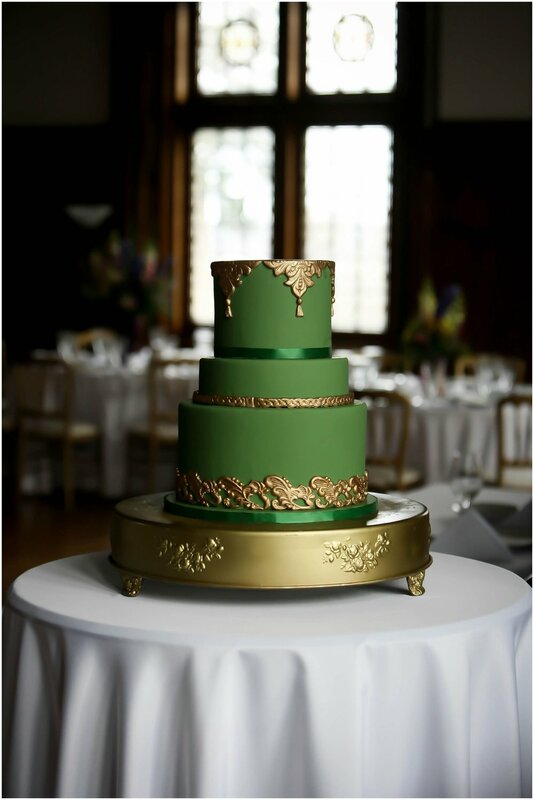 We chose 2 wedding cakes, which spoke to the taste of each of us. 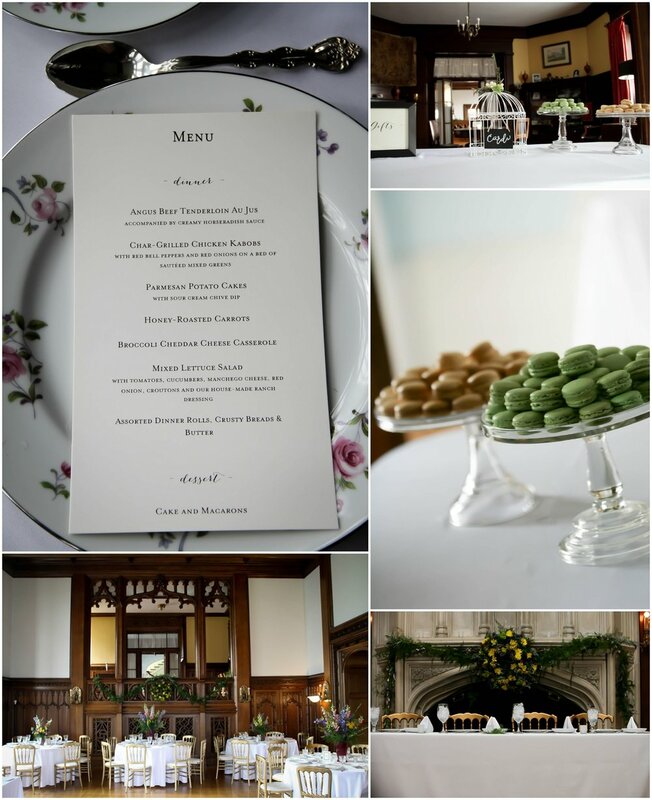 As guests arrived the ambrosial scent of our meal wafted throughout the corridors. Our meal was as beautiful to the eye as it was delectable to the palate, a farm-to-table feast of tender beef and saucy chicken Kabobs, nectarous carrots and warm crusty breads. Later we nibbled on pistachio and almond macarons as we sipped our coffee. Every table was set with a different vintage china pattern and adorned with a unique centerpiece, so that every group of guests enjoyed a slightly different aesthetic as they devoured their meal. The ranunculus flower was a hallmark of the evening; beloved by both me and Lilli, it was the primary illustration on our wedding stationary and it was tucked away in the foliage that night! To me it was the perfect dinner. We wore elaborate gowns modified by our mother. Our grooms chose tuxedos to suit their respective bride. We had a full Jazz band play from the balcony above the dance floor while we and our guests danced into the wee hours! The whole evening felt like an homage to the good, old-fashioned parties of the Jazz Age! 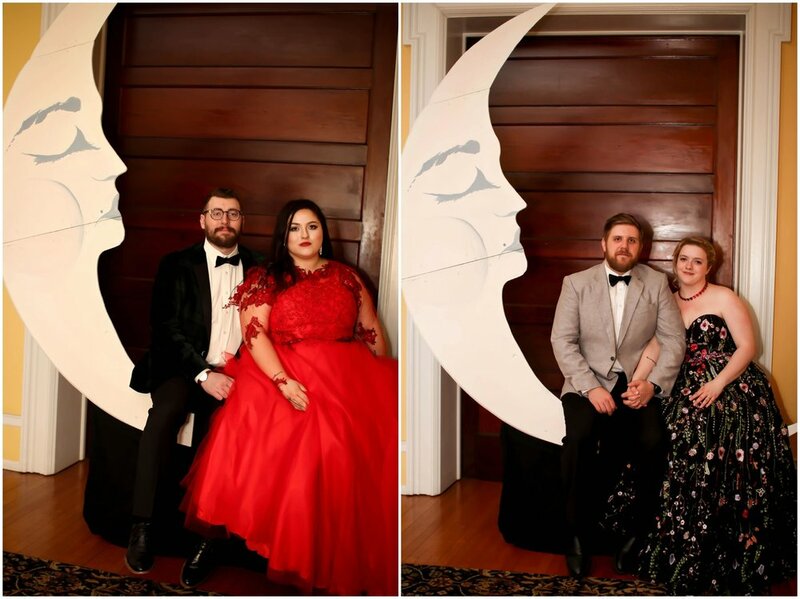 Our brother Thom and his wife Maddie built us our very own wedding moon, paying whimsical tribute to the lovely brides of the 1920s. We had music and laughter which spilled onto the lawn, where we all sent massive paper lanterns soaring into the sky with whispers of well wishes for the years to come! It truly WAS a momentous occasion filled with those who mattered most to us! In retrospect, the highlight of the evening for ME had to be seeing my 83 year old Nana, now gone, be waltzed around a ballroom, engaged and filled with delight. My husband often talks about the electric connections he felt that evening with his family and friends, having everyone so close at hand and also seeing the glint in our daughter Lucy's eyes as he twirled her around the Music Room. From Lillian: We couldn’t have asked for a more picturesque setting for our celebration. Berry Hill Mansion’s many magnificent windows and balconies served as a perfect romantic backdrop for our day. The balconies with which I had become quite acquainted, as Cameron and I snuck out, he in his suit and I in my sweats and bare feet, to watch as our family and friends rolled in dressed to the nines. It was such an exciting sight! A sight I would have otherwise missed, had I have been capable of getting myself ready rather than having to wait for Hannah, who had promised to fix me up as she had done for every important occasion before. When I finally made my way into the grand hall donning my beautiful floor length dress, which hid the fact that I was still bare foot unbeknownst to anyone else, melodious music filled the air and our people awaited to wrap us in hugs and well wishes. It’s such a wonderful experience to be in a room and look out and see all of these people celebrating your love. That was our favorite part; Just feeling and embracing the love around us. THAT - and the carrots! Cameron hasn’t stopped talking about the carrots.